Sh’lach L’cha recounts the journey of the twelve scouts, one for each tribe of Israel, as they make their way into the Land of Canaan for the first time. 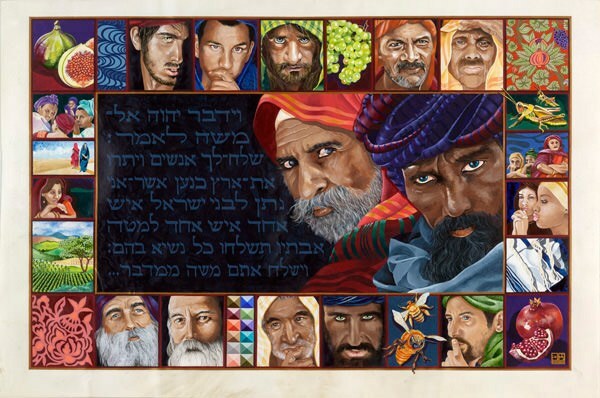 This work concentrates on expressing the strength, wisdom, and compassion of Caleb and Joshua, who were confident in their decision to enter Canaan. It portrays them in contrast to the other ten men, who convey a mixture of doubt, anxiety, disagreement, and opposition — alongside the women of the community who had to build their own strength to face the difficulties. Professional Background Aliza Freedman is a Hebrew calligrapher, artist, and weaver with work showcased throughout the US, London, and Australia. Freedman made aliyah [immigration] to Israel in November 2014 and currently lives in Netanya, Israel. Her art is integrated into the Women of the Book's logo.